Hawiian hula. Helen Louise and Frank Ferera. Indestructible Record: 3407. 1917. The Indestructible Phonograph Co. of Albany, New York, produced molded celluloid cylinders beginning in 1907. The company made both two- and four-minute cylinders, and the repertoire was similar to that of Edison and Columbia cylinders. The cylinders had a thick cardboard core and metal rim ends to keep them rigid. 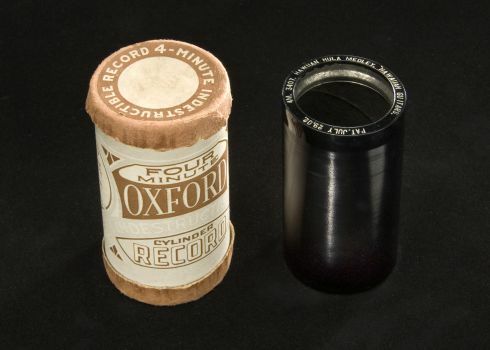 Production continued until 1922, and cylinders were issued both under the Indestructible Record label and also for Sears, Roebuck, and Co. as Oxford Indestructible Records, as pictured above. From 1908 to 1912 they were also distributed by the Columbia Phonograph Co. Regardless of the brand under which they were sold, Indestructible cylinders all have the same content for a given catalog number and carry no company identification on the cylinder itself, so if they have become separated from their original boxes, the different brands are indistinguishable.